Armchair Fiction presents extra large illustrated editions of classic mystery-crime double novels. 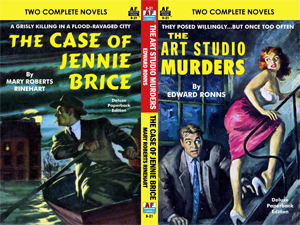 The first novel is “The Art Studio Murders” by Edward Ronns. Henry Dana was a young artist on the cusp of success. His agent knew Dana was a sure thing and planned a big art show to show off his client’s talents. But the day before the show, terrible things began to happen. It started when Henry narrowly escaped being run over by a train. And there was no mistake about it—he had been pushed! Then, returning to the studio, he found the walls and floors indiscriminately blanketed with oil paints. However, the biggest blow was the discovery that Henry’s best works—paintings he had slaved endless hours in the creation of—had been shredded to ribbons! Henry Dana was crushed. What kind of heartless wretch would do this, and most of all…why? No, things were not adding up, and soon even Henry’s closest friends became suspect. And when the dripping red paints of death flowed onto the scene, Henry found himself the prime suspect in a macabre murder. And when his own brush strokes promised to reveal the killer, by then it was too late! The second novel is “The Case of Jenny Brice” by a very well-known mystery writer of the early twentieth century, Mary Roberts Rinehart. Why a man on trial for his life appeared so cool, calm, and amused at the proceedings? How a little teetotaler came to sudden grief when he tried to act out the part of a suspected killer? What happened to a missing onyx clock and where it was finally found? Why a poor and lonely widow didn’t reveal her identity to her ever so wealthy niece? The identity of the mysterious woman who crossed the bridge in the early hours of dawn? A deluge of starling answers awaits you this gripping story of a most grisly killing. The police are baffled, but an amateur criminologist and his landlady set out to solve this amazing crime in a flood-ravaged city.